Proper water care is the key to everything you want: a healthy swimming environment, a beautiful focal point for your backyard, and long-lasting pool equipment and liner (if yours is a vinyl-liner pool). It’s also the most challenging for new pool owners to get a handle on. Most pool chemical manufacturers try to create products that are simple and straightforward to use. But you still have to have a basic understanding of pool water care to make the most out of these products, and to use the right products, in the right amounts, in the right circumstances. Many pool owners make the mistake of just dumping more chemicals in the pool when there’s a problem, but without knowing what you’re doing to the chemistry of the water, they can well be doing more harm than good. Aqua Pools offers regular pool maintenance services, if you’d like to hand the job over to us. But if you’re a dedicated DIY-er, read on for the information you need to be a water care success. The foundation of good water care is the pump and filtration system. It keeps water moving, for one, and as we all learned from the creepy green pond near our childhood homes, stagnant water is the ideal breeding ground for all things yucky. The pump also circulates the pool water through the filtration system, which removes most of the dust, dirt, debris, and organic matter that lands in your pool water. If you don’t see gross stuff in your pool, that’s because it’s caught in the filter — which serves as a good reminder to keep that little beauty cleaned out! Trust us, the stuff is getting in your pool. Leave your patio furniture outside and uncovered for a few days, and you’ll come back to a (albeit thin) coating of dust. That dust is always in the air, always falling, and always landing in your pool. Swimmers also introduce yuckiness into the pool environment, from the dirt on their little footies to the germs on their little bodies. Always keep your filters cleaned and replaced according to those owners manuals. Check immediately if you hear funny noises coming from your pump, or worse, hear NO noise. We are authorized to service all Hayward pool equipment, so if the pump or other equipment has problems, give us a call. We can either diagnose and fix the issue onsite, or for more serious issues, bring it into our service department. We honor all manufacturer warranties in effect. Sand Filter — Sand filters are cleaned by reversing or “backwashing” the flow of water in the pump. Do this when the pressure gauge reads 7-10 lbs over normal readings. Once a year (opening is a good time), clean your sand filter with a filter cleaner. Cartridge Filter — Clean a cartridge filter by removing it and washing it off using your garden hose. The soak the element in filter cleaner for 12 or more hours. Rinse again with water. Since these are out of commission for awhile during cleaning, most owners buy a secondary cartridge filter to use while one is being cleaned. Clean your cartridge filter when the gauge reads 7-10 lbs over normal. Diatomaceous Earth Filter (DE) — DE filters are cleaned like sand filters, by reversing the flow of the water. Afterwards, you need to add more DE to cover the grids inside the filter. Do this when the gauge reads 7-10 lbs over normal. pH levels are important. Your pH level should hover around 7 (neutral), ideally between 7.2 and 7.6. Check it about once a week. If it gets too acidic (too low), it can cause your pool equipment and finish to corrode. Too alkaline (high or “base”) can cause scales, deposits, and cloudiness in the water. Also, chlorine is most effective at a neutral pH. It’s a good idea to bring a sample of your pool water into one of our locations from time to time to make sure your readings with the home test kit are accurate. Calcium is our next concern. Low calcium can lead to staining of your pool surfaces and causes vinyl liners to wear out quicker. High calcium levels leads to unattractive deposits of calcium on the pool surfaces, as well as the equipment. Owners of concrete pools should keep calcium levels between 200-250 parts per million (ppm). 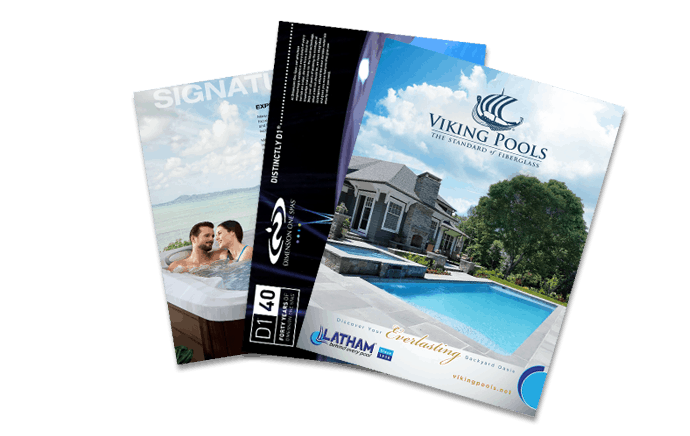 Vinyl pool owners should shoot for 175-225 ppm. Fiberglass owners should strive for 200-400 ppm. If you’re having trouble keeping your calcium at good levels, bring a sample of water from your garden hose in for testing. It could be a problem with the water used to fill your pool, instead of issues keeping the balance right with chemicals. Metals are a big no-no for pool owners. It stains your pool. The usual suspects that make their way into your pool water are copper, iron, and nanganese. Stain and scale removers remove harmful metals from your pool water, but it’s important to find and stop the source, if at all possible, to prevent long-term issues. Sanitizers kill bacteria and viruses in your pool water. There are many potential sources of these bacteria and viruses, including, but not limited to, swimmers, pets, birds, wildlife, etc. Aqua Pools carries a variety of sanitizing systems, and we can work with you to find the best solution in your pool, as well as choosing the right products, and learning how to properly use these chemicals. Sanitizers do a pretty good job, but cannot completely kill or remove all the potential yuckiness from the pool water. Enter, stage right: Shock! Shock keeps water clear, keeps algae at bay, and helps kill the organic waste that makes its way into your pool via swimmers and whatever animals come around. Unsurprisingly, algae is a hardy creature. In addition to your usual sanitizing and shocking, you’ll need to add a specialized algaecide to your pool. Aqua Pools can recommend the best product for your situation. We carry both preventative and treatment algaecides. This is about as simple as we can explain the complexities of pool water care. If you have questions, or just want to forego all this and enjoy your pool, reach out to our pros at Aqua Pools for help or to set up a regular pool maintenance plan.